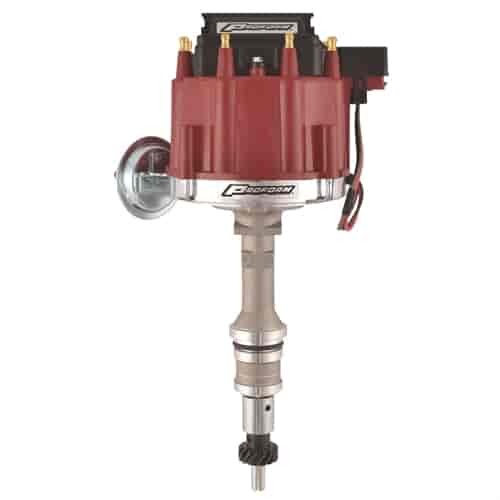 Utilizing the durable and dependable High Energy Ignition (HEI) system pioneered by GM, these distributors avoid the unsightly wiring of stock Ford electronic ignition systems by installing this one-piece distributor with an internally positioned coil and module. Easy to install: just connect one 12-volt hot wire to the distributor (has optional tach hook-up). These units offer calibrated advance curves that are optimized for maximum combustion efficiency and for the elimination of detonation damage and throttle ping. Assembled from precision-madeparts for advance curve smoothness. Offers longer term durability and a higher voltage spark that permits a bigger spark plug gap, resulting in more power and reduced plug fouling. Each unit includes a high-power coil, a premium hi-dielectric cap with brass terminals, and a low-saturation ignition module. By eliminating the stock-Ford ballast resistor, more ignition voltage results in improved spark. Incorporates easily found High Energy Ignition (HEI) replacement parts. Assembled with upper and lower bushings (stock Ford distributors have only a single bushing). Technical Note: Gear not compatible with billet roller cams. Does Proform 66969R fit your vehicle? 66969R is rated 4.7 out of 5 by 3. Rated 5 out of 5 by kvfpe from Major improvement Much better than adjusting points - installs same as any other distributor. They should include the pigtail that snaps into the bottom for the positive + tach, but they are on amazon. I did need to switch to a smaller air cleaner to fit. Rated 5 out of 5 by Dougs Garage from Good people to deal with As always, Items are as described and fast shipping! They are pretty good if you accidentally order the wrong part and have to re-order the correct piece too! Can you get a bronze gear so this can be used with a roller cam? Yes this will work in your Mustang. Does this distributor use 7mm or 8mm plug wires? This can use either the 7mm or an 8mm plug wire.